Last January the EPA released its freshwater criteria proposals on schedule, but they also released ahead of schedule preliminary proposals for estuarine criteria. During the course of the first EPA comment period, a large amount of input was received from the National Estuary Programs and other respected science-based organizations regarding the science upon which the preliminary estuarine proposals and the South Florida canal proposals were based. During the summer the EPA asked the plaintiffs if we would agree to a 10-month extension for the proposal of the estuarine and new South Florida canal criteria. The freshwater criteria numbers were based on methodology used for over 10 years (well vetted); however, the science for estuarine and canal criteria was not well-established so the plaintiffs agreed to the 10-month extension. The original schedule for finalized standards for lakes, rivers, streams and springs was in October. However, as a result of the additional comment period provided to the public by the EPA this past summer regarding changes made to the original January freshwater proposals, the EPA requested and got from the plaintiffs, a 30-day extension in order to have the time to review, consider and respond to the entirety of submitted public comments. The final freshwater rules will be implemented this coming November 14. All along the way Florida’s Big Polluters have attempted to thwart the process. 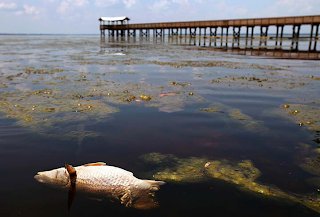 When legal challenges to the settlement went nowhere, Big Agriculture, Big Wastewater and Big Pulp began a misinformation campaign to garner support from the Florida congressional delegation. They were active all summer lobbying both sides of the isle and at the end of September Senators LeMieux and Nelson wrote letters to EPA asking for a delay in the criteria. Several weeks later Senator LeMieux, with Senator Nelson’s support, attempted to put a stop to the new pollution limits by amending the federal budget for 2011 to prohibit EPA from funding the promulgation of the rule. Luckily their efforts failed. To say the least, we were dismayed at Senator Nelson’s turnabout on clean water protection. He toured the algae covered St. Johns River this past summer and knows how sick waterways can devastate local economies. The Sierra Club has requested a meeting with Nelson in order to separate the fact from the fiction being portrayed by the state’s wastewater treatment utilities and large-scale agricultural production facilities. Although nothing can stop the freshwater rule from being finalized in November, we are sure that polluter forces are still pressuring Congress for relief from the new pollution limits. The lame-duck congressional session later this year and subsequent appropriations bills will offer Florida’s Big Polluters the chance to turn back the clock.